Hey kids, what time is it?! It's time for "What's On My Workdesk Wednesday"! AKA "What's On My Art Table Wednesday"! It's so fabulous it has two names! Workdesk. Art table. Tomato. Tomahto. Actually the posts I started doing (and apparently stopped) were called "What's On My Art Table Wednesday?". Today it's changed because I want to participate in "What's On Your Workdesk Wednesday" (WOYWW) over at the Stamping Ground blog. I took this photograph yesterday when what was in front of me while art-ing struck me as such a beautiful colorful mess. And I love those kinds of messes! The colored bits of paper are all painted by me for use in my mixed media collage. This photo shows quite a lot of the various media I like to use. I use paint, markers, paper, inks, stamps that I make myself, fiber, ribbons, watercolors, stencils - both homemade and purchased, gel mediums, and paper punches to name a few. The piece I am currently working on is that tiny oblong rectangle of green next to my yellow striped scissors. That is the size of my original collages for my line of domino pendants. Tiny. This photo was taken with my iPhone 4S, with which am I madly in love. The resolution is much better than previous models. Mixed with fun photography and editing apps it's a handy artists' workhorse. This was photographed with Camera+ and then edited in Instagram. You can find me on Instagram by the name of HeyVickie. Thanks for dropping by to my studio "virtually". I'd have you over personally but this place is a mess! I'm not being paid by anybody for any of this. Just sayin'. what an inviting desk! that certainly is a wonderful picture! no wonder my daughter also love the iphone4! thank you for sharing! Wonderful view! Glad you decided to join in, and as you say, tomato tomahto...I'm a tomahto speaker! Love the coloured textures I espy, and generally that successful use of the 'push back' technique that so many of us use to make space. Go you! Going to visit the link now. The thing about my studiois, yeah, it might look like a bomb went off, but ask me where the star shaped glitter is and i'll pull it right out of that chaos! Organized mess, that's what I call it. WOW, what a wonderfully creative, inspiring desk,table mess, its beautiful! Love your detailed work and your mess! Late as usual with my visits for WOYWW but it’s been great having a peek into your crafty world this week. 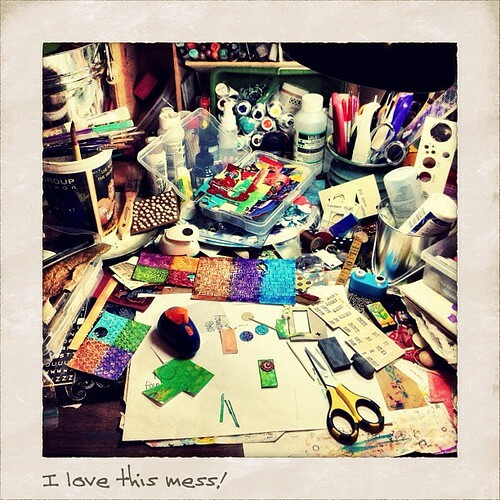 Loving your mess…..sorry I meant to say desk, Lol! Have a great week and …………………………………………. It is a lovely colourful mess! I'm working my way through this weeks WOYWW - I’m finally on the home straight! Oh Vickie, you're so brave! One of these days I'll be brave too and post a picture of my studio without cleaning it up first!